I've decided I'm going to go back to my now-deceased Seven Magpies group blog and pick some of my favorite posts to share. I'd like to condense my multiple blogs into one place (feeling a bit like my failure to blog is the fact that I've been spread too thin), so I'll be cross-posting old entries from my other blogs here in an effort to bring all of my favorite things to one place! 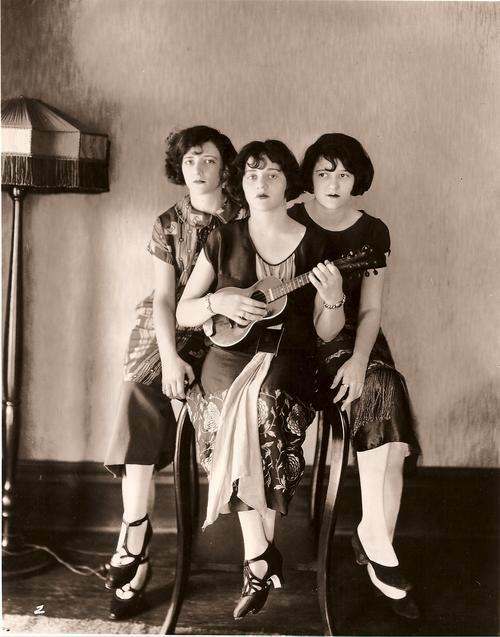 The Boswell Sisters formed in 1925 as a three-sister singing group from New Orleans, and their jazzy complex harmonies were a local sensation for half a decade before they moved to New York City in 1930. After they moved to the Big Apple things really took off for them and they began recording for Brunswick Records. The three sisters were very actively traveling the USA for shows during the second World War but unfortunately not allowed to visit bases over seas for foreign troop rallying and whatnot due to an unfortunate childhood accident that left the middle sister, Connie, paralyzed and wheelchair bound. This is a streaming version of "When I Feel Lonely" which is very snappy and was the first song the sisters recorded back in 1925! You can find loads more like this at Archive.org which offers public domain music streaming and downloads. It's a great website! This is another of their popular songs, from later in their career. I love the way they bop as they sing! If you have time, this is a nine minute short called "Close Farmony" which is a seriously amazing (albeit mildly bizarre) film about how jazz music saves the farm! The sisters and the farm hand spend the film serenading farm animals, trying to encourage them to produce more milk and eggs. It's hilarious! The best part is the piano covered in hay. Yesterday, however, we had a cold snap and I woke at 4AM to a house with every window open wide on a breezy 42ºF morning. It was cold enough in my house that my hands and feet tingled after I left the comfort of my warm bed. My mind snapped immediately to the thought of warm oatmeal, but being "off" of oats as well as wheat (and soy and processed sugars... I'm sure you'll read more about that later when I get to posting it) oatmeal was out of the question. It wasn't until I was nearly ready to leave for the horse farm that my mind snapped to the odd little box I'd picked up at the grocery store. It was super simple - a 1/4 cup of buckwheat, 3/4 cup of liquid (I used 1/4 cream, 1/2 water), a sprinkle of salt and 3 minutes in the microwave! Voila! Buckwheat is slightly on the sweet size as far as grains go, and it has a mild millet-esque nuttiness that I absolutely adore. I really like a bit of sweet for breakfast, so I chopped up a medjool date and mixed it into the buckwheat to add a delicious caramely taste. 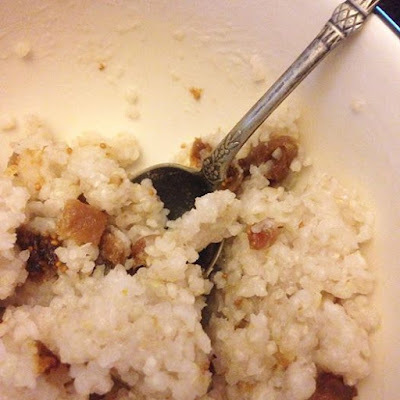 When I made it for breakfast again this morning I added a chopped dried fig, which added a sweetness and a fun texture. I'm fairly certain the possibilities are endless! I didn't know much about the brand, but Pocono appears to be milled at The Birkett Mills in New York, which is where most of the nation's buckwheat originates. I'll definitely be checking out their other buckwheat products! Do you have any gluten free breakfast favorites? I have been ruminating on the nature of blogging, and how when you really get going you find yourself feeling accountable to your readers. At first it's a great feeling, knowing folks are enjoying your writing and looking forward to the next post, but if gone about the wrong way (see "Dark Days of Winter" posts) you can burn out quickly, and apparently quite permanently. Often I find myself thinking "I want to write about this! I'll go make up a blog post!" which is quickly stifled by a much louder, desperate voice in my head that says "Nooo! You can't get caught up in that again. You don't have time!" So then I sit on my ideas, and snap a few photos that no one gets to see and I grumpily concede to the louder voice of reason... I don't have time for a regular blog. This morning I found myself wanting to write about a few things that I've been up to this week and for some reason a new voice popped up in my head. "I'll be damned if I let the claustrophobia of having a regular blog make me feel like I can't post!" No, I won't post regularly. I might only post 5 times a year, but if someone wants to read what I write it'll at least be there for them to do so. I used to take such pleasure in getting up in the wee hours of the morning to write. Let's see if I can get back to doing that, even if only on occasion.